BEIJING — A Chinese judge sentenced a Tibetan shopkeeper to five years in prison on Tuesday for inciting separatism, based on his comments in a New York Times documentary in which the man talked about the erosion of his culture and language in the tightly secured region. Tashi Wangchuk's lawyer Liang Xiaojun told The Associated Press that his client said earlier that he planned to appeal the sentence handed down by a judge in the western city of Yushu in Qinghai province. Liang said he was unable to comment further due to a court-issued gag order. Rights groups condemned the sentence, saying Tashi had committed no crime either under international law or the Chinese constitution. Tashi, 32, was detained in 2016, two months after the video and accompanying article were published, and went on trial in January. He had pleaded not guilty to the charge of incitement to separatism. Counting time served, Tashi should be released in 2021. However, Chinese political prisoners are frequently subject to additional restrictions, including house arrest, after being released. The case highlights the authoritarian government's extreme sensitivity to issues involving ethnic minorities — especially Tibetans and Uighurs native to the northwestern region of Xinjiang — as well as the risks Chinese citizens run when criticizing government policies to foreign media. At his trial, prosecutors presented the nine-minute video the Times made in 2015 as the sole piece of evidence against Tashi. The film and article told of how Tashi tried to sue local officials for denying Tibetans education in their own language and Buddhist culture. The Times' website is blocked in China. In the documentary, Tashi, who was described in it as a shopkeeper, spoke extensively in China's main language, Mandarin, about the "pressure and fear" felt by Tibetans and his worry that their culture is being wiped out through the steady erosion of their language. The Himalayan region is almost entirely off-limits to foreign media, but rights groups report increasing repression along with a mass campaign to promote Mandarin in education and employment that Tibetans say leaves them economically marginalized. As with Xinjiang, Tibet has seen waves of migrants from other parts of China, along with a stifling security presence and heavy-handed political indoctrination aimed at ensuring loyalty to the ruling Communist Party. The verdict against Tashi is a "gross injustice" and he should be immediately and unconditionally released, Amnesty International East Asia Research Director Joshua Rosenzweig said in a statement. "He is being cruelly punished for peacefully drawing attention to the systematic erosion of Tibetan culture. To brand peaceful activism for Tibetan language as 'inciting separatism' is beyond absurd," Rosenzweig said. 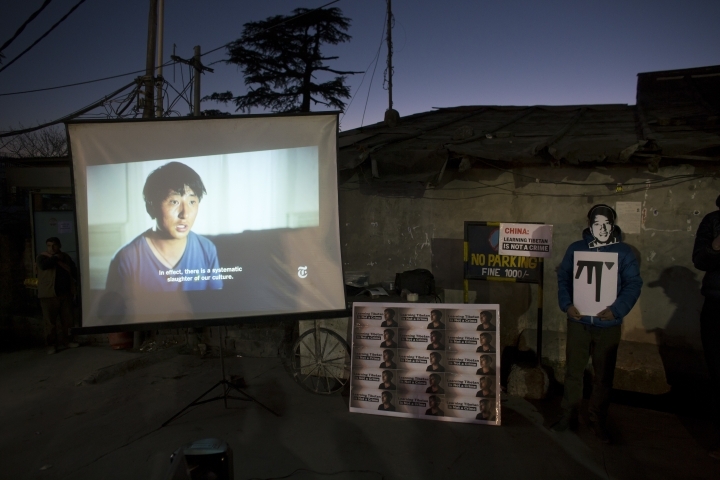 "Tashi Wangchuk has shown incredible courage in his battle to progress the fundamental rights of the Tibetan people," Mattias Bjornerstedt of the Swedish Tibet Committee said in a statement. "China has demonstrated today just how much it regards such courage as a threat, by imposing a long, politically-charged sentence on an innocent man." Chinese authorities had barred foreign diplomats and reporters from attending Tashi's trial and his detention was condemned by a group of U.N. human rights experts who called for charges against him to be dropped.